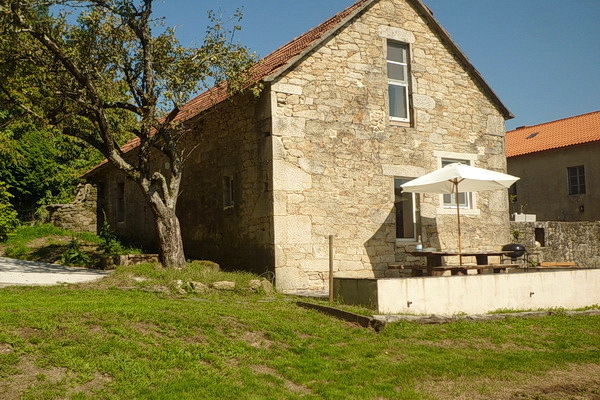 The English owner of this beautiful barn conversion, set among pine and chestnut woods and looking out over fields in the sleepy hamlet of As Lobeiras in the Rias Altas of Galicia, spotted its great potential on the dullest, wettest winter's house-hunting day. 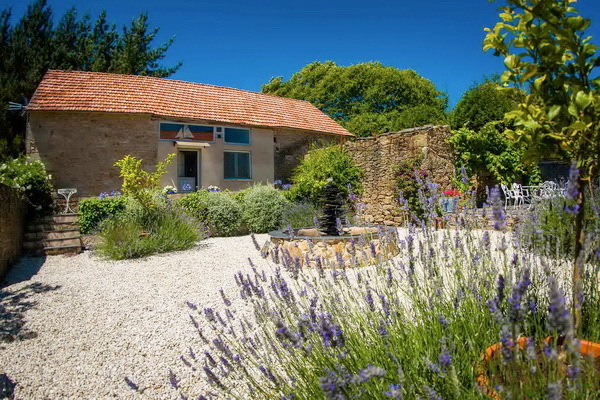 With her artistic flair and talent, and making full use of existing materials, she has created an exceptionally light, attractive and relaxing holiday home. 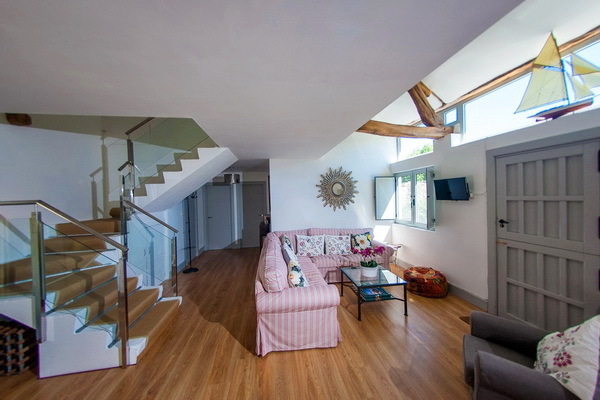 Comfortably and stylishly furnished, decorated and equipped, designed with a great feeling of space, it is a haven of peace, ideal for those wanting to get away from it all. There is plenty of outdoor space too, with an attractive patio for eating out and an enclosed garden at the side of the house. At the back there is a very pretty courtyard with a fountain made from the original slate roof of the barn, which is shared with the owners who live in the main farmhouse across the way. In a dreamy, rural spot, it is a short drive down to the old town of Mino on the coast and to a choice of wonderful, sandy beaches which are popular in the summer. You are within easy reach of the lively cities of A Coruna and El Ferrol and nearer at hand medieval Pontedeume and Betanzos with its Celtic origins. Two impressive ruined monasteries are literally down the road as are Las Fragas do Eume, one of the best conserved forests in Europe with all sorts of outdoor activities for the energetic. Here you have the best of both worlds! N.B. A generous welcome pack is left by the owner for all visitors. Also, the owner can arrange a masseuse to visit, should you feel like a top rate massage at reasonable prices. Large enclosed drive, rough grass garden and walled patio area. From this to stable style front door which opens into very spacious open plan living room/kitchen. Stable style back door from this room opens onto a low walled patio (for clients' use only) and a very pretty courtyard with a fountain (this is shared with the owners). From living room/kitchen to cloakroom and two bedrooms (one with bunk beds and one with two singles and an ensuite bathroom). Up stairs from living room/kitchen to landing. Off this, two bedrooms (two doubles with en suite bathrooms). WiFi connection is available at this property. 2. Surfing courses at Mino, Valdovino, and internationally renowned Pantin. 3. Sailing courses at Sada. 4. Amazing Natural park of Fragas Do Eume - one of the best conserved forests in Europe - great for walking, cycling, swimming, kayaking, horseriding and birdwatching. 5. Visit the ruined monasteries of Caaveiro (founded in 934) and Monfero (C12th) and its church with a chequerboard facade. 6. Wander round charming, medieval Pontedeume on the estuary of the same name. 7. Soak in the culture of Betanzos with its Celtic origins. 8. Make easy day trips to the cities of El Ferrol and A Coruna with all their history. 9. Delight in the local markets at Pontedeume (Saturdays) and Mino (Sundays). Painted white throughout. Wood floors. High ceilings. Original beams. Windows in all rooms. Mosquito nets on windows. Interesting pictures and artistic touches. Stylish, comfortable, modern furniture in the country style, blending in perfectly with the decor. Bedroom Details: 1 twin with ensuite bathroom (grdflr), 2 bunks (grdflr), 1 dbl with ensuite bathroom, 1 dbl with ensuite bathroom (upstairs). Bedroom 1: On ground floor. Two singles (80 cms), easy chair and hangers. Window. Ensuite bathroom. Bedroom 2: On ground floor. Two bunks. Window. Bedroom 3: On first floor. One double bed (160 cms - two singles pushed together). Chest of drawers. Chair. Hangers. Large window. Ensuite bathroom. Bedroom 4: On first floor.One double bed (160 cms - two singles pushed together). Chair. Screen and hangers. Large window with view onto fields. Ensuite bathroom. Cloakroom: On ground floor. W.C. and washbasin. Washing machine is housed here. Ensuite bathroom: On ground floor. Large bath with overhead shower. W.C. and washbasin. Ensuite bathroom: On first floor. Large bath with overhead shower. W.C. and washbasin. Ensuite bathroom: On first floor. Large shower unit. W.C. and washbasin. All bathrooms have white fittings. Very good water pressure. Comfortable six seater sofa with a glass topped coffee table in one corner of living room. Small armchair. Rustic wood dining table and eight dining chairs. Bookcase and mirror. Windows looking out onto patio, garden and fields and woods beyond. Fully fitted kitchen across one wall of the living room. White base and wall units. White worksurface. Window looking out onto drive and woods behind sink. Practical and easy to use. Very well and nicely equipped. Plenty of crockery, cutlery and glasses, all chosen with taste. Paved low walled patio at back of house, sharing courtyard with owners. Further paved walled patio with wood dining table and benches, parasol and BBQ and enclosed rough grass garden at side of house. Fields and woods beyond. In enclosed drive beside the house. 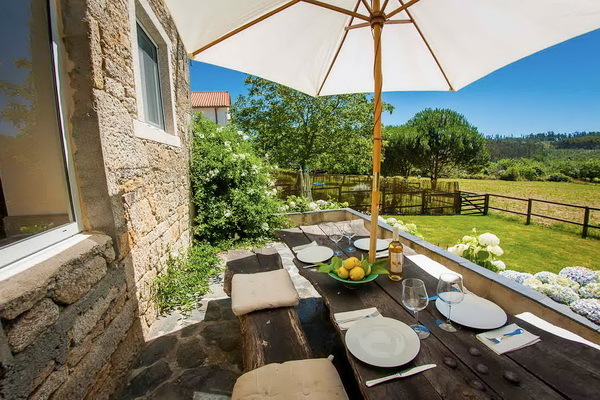 Casas Cantabricas recommends this property as being suitable for people with walking difficulties. NB This does not necessarily imply that the house is prepared or officially graded as suitable for disabled use, but rather that it has characteristics, listed below, which make it more comfortable for people with walking difficulties. Please don't hesitate to contact us for further advice on this.